I’m a biologist with a particular interest in and love of the rainforest. My first taste of the jungle was as a teenager when I joined an expedition to Belize, and after that I couldn’t wait until I could find a way to the ultimate jungle, the Amazon. I’ve spent many months in Peru since then, mostly chasing leafcutter ants and birds, and carrying out research for my undergrad and PhD dissertations. Postdoctoral research focused on the relationships between tree diversity, composition, and ecosystem function in a native species plantation in Panama. 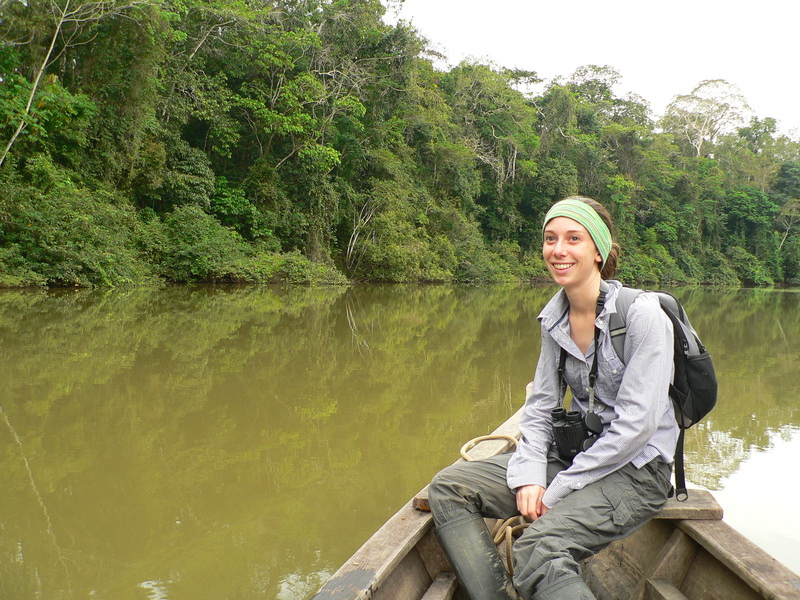 I’m now a freelance science writer, regularly contributing to Mongabay. With this blog I hope to share some of my fascination with this part of the world and its incredible biodiversity, give an insight into a biologist’s life in the field, as well as share research and conservation news from the tropics and further afield. You can contact me at ajunglescientist [at] gmail dot com, and for details of my research and ongoing projects please visit my website. I’m really enjoying following your blog and Facebook postings and am sharing them with the teachers and students I work with. Thank you for giving a voice to field biology! Thank you, I’m glad you are finding it interesting! Fantastic stuff! I can’t wait to read more! I do have a question as I am preparing for my first ever field expidition: what are 5 things you couldn’t live without in the field? Thanks for reading! That’s a great question, perhaps worth a whole post in itself when I get a chance. Off the top of my head, I’d be very frustrated without binoculars and camera, dental floss comes in very useful for all sorts of things and is tiny and strong (hanging mozzie nets, washing line etc), insect repellent goes without saying, and when I was in the field for months at a time a small bottle of nice shower gel and/or face scrub was a welcome treat…Have a great trip! I was wondering if you could help me give my sister-in-law some advice. She is moving to Ecuador, near La Libertad, and wants to know what plants she could grow that would attract hummingbirds. I know temperate plants but not much about tropicals. Thanks! Hi, I wish I could help but my botanical knowledge is hopeless, sorry! As a general rule, hummingbirds favour red, and have co-eveolved with some flowers which therefore have trumpet-shaped blooms. So, red trumpety looking ones haha! We also saw lots of hummingbird feeders which were very successful at attracting them. Hi, I had a quick look through your posts – it took me straight back. We recently spent 9 days at an Amazon lodge and research centre on the Tayhuao River out from Iquitos. We were out in dinghies or canoes or hiking everyday. Swam with pink dolphins! Thanks for the ‘like’ on the post about Chinchero. We loved Peru – spent 2 months there going all over. Thanks for stopping by! Your jungle trip sounds wonderful, I look forward to reading about it on your blog. There’s so much of Peru I’d still like to see, despite spending a lot of time there already. Enjoy your travels!